An Camas Mòr is founded on the principle of making a good habitat for people and nature. A place where the community and local wildlife can mutually benefit each other will create an environmentally, socially and economically sustainable future for The National Park. We formulate a vision and a program of activities based on the type of life that are inherent in a given area. 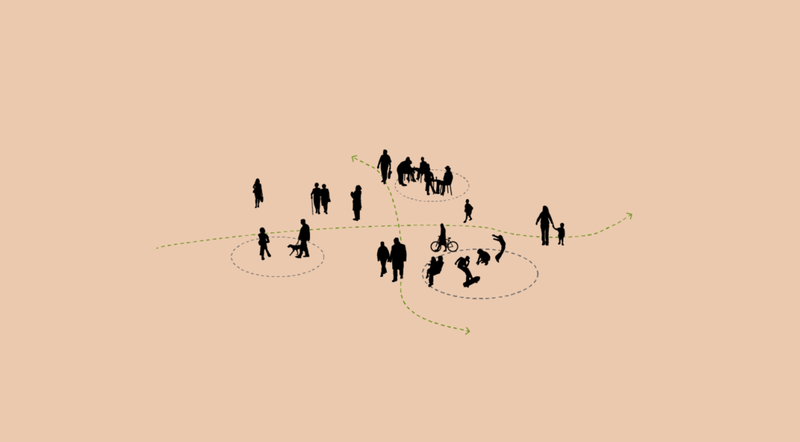 We develop a public space network that can support the proposed public life through scale, form and climate. We envision how buildings can contribute to our public life aspirations, in terms of height, massing and scale, as well as functionality and interaction. An Camas Mòr is planned to meet Aviemore’s housing needs for the next 30 years, with about 30 – 50 homes a year. The masterplan includes a job for every home, a school, village hall, nursery, new shops and cafes, offices, workshops, community hall, playing fields and allotments all within five minutes walk 400 metres of home. As a community we need to conserve the Scottishness of our Highland towns and not let them deteriorate into bland housing developments.... more birch trees, stone dyke walls, slate roofs, one storey dwellings, granite, local architecture...modest functional dwellings reflecting Scottish ethos. 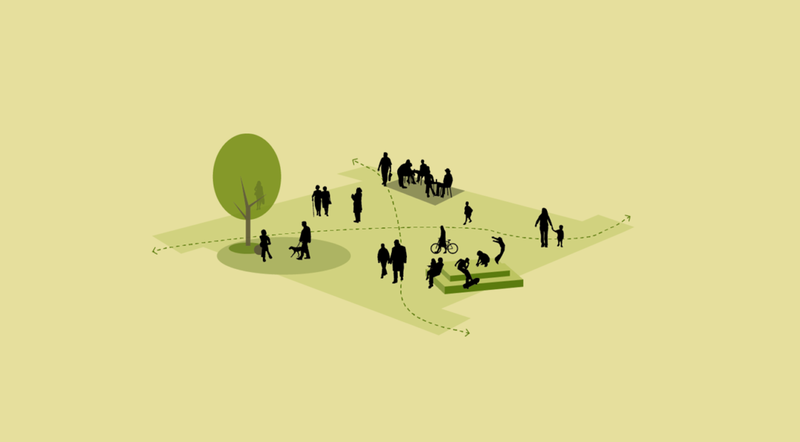 The Masterplan has been guided by the thoughts and wishes of people who attended a series of workshops between 2005 and 2018 led by architect David Sim, landscape architect and fellow Scot, Louise Jane Martine. 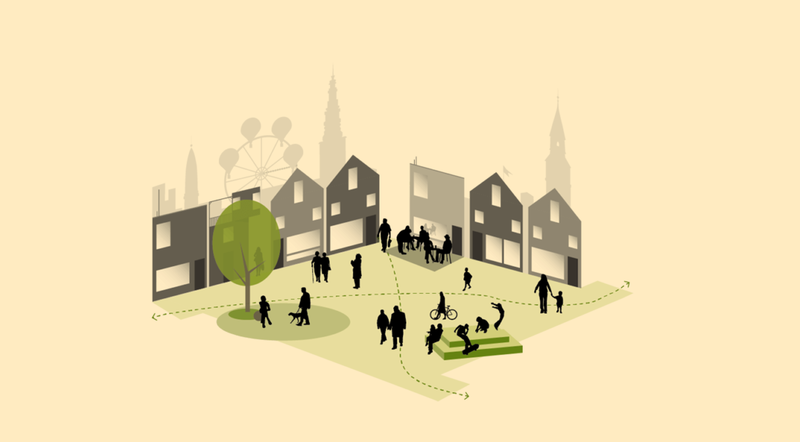 David leads a team at Gehl, Copenhagen who are leaders in the field of sustainable design. An Camas Mòr will rekindle the Strathspey tradition of forest villages. Living in the woods is a custom we share with Nordic countries, so it is a natural place to look to for a design that respects our local wildlife and is in tune with our outdoor culture. An Camas Mòr is … a project about people. We have a responsibility to make something exceptional in Scotland, a really great place, a platform for a better quality of everyday life and a place some really great and hard-working people will be proud to call home. The core design principle for An Camas Mòr is to provide a good habitat for people and nature by concentrating on the Gehl approach of first life, then spaces and finally buildings, to create a special place that accommodates housing, community, workspace for all. Gehl never plan just a housing estate, they push for an ambitious level of mixed-use to create authentic pieces of village, town or city. This makes a place where different kinds of people can live locally throughout the different phases of their lives. The Scottish Government’s Sustainable Communities Initiative selected the plans for An Camas Mòr as one of 11 exemplar proposals from a short list of over 80. An Camas Mòr has a small physical and environmental footprint – with a radius of 400 meters or a five-minute walk to work, school and the shops. This concentrates as much development as is reasonable, on as small an area as is possible, to protect naturally sensitive areas from unnecessary development in the future. At a national level, An Camas Mòr has already shown a bold vision of being an exemplar new community it’s setting in a sensitive area and the prioritisation of environment shows how sustainable communities can be developed for the benefit of the local population and the environment. 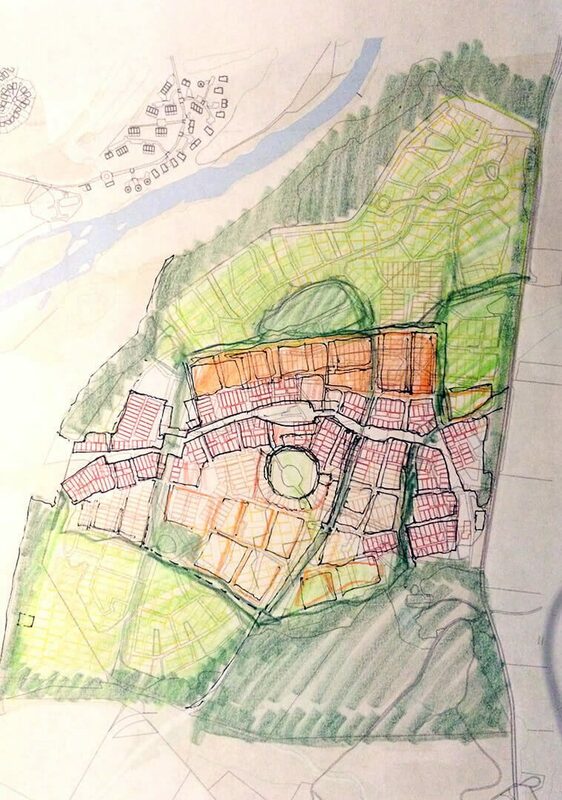 The layout for An Camas Mòr is grounded on an understanding of historic Scottish towns which respond to our need for affordability, walkability, useful public space, and climate adaption. This will ease the community’s cost of living both financially and environmentally. Affordable homes are not just a matter of finance – An Camas Mòr has thought through the ways that design can enable people to afford a home. 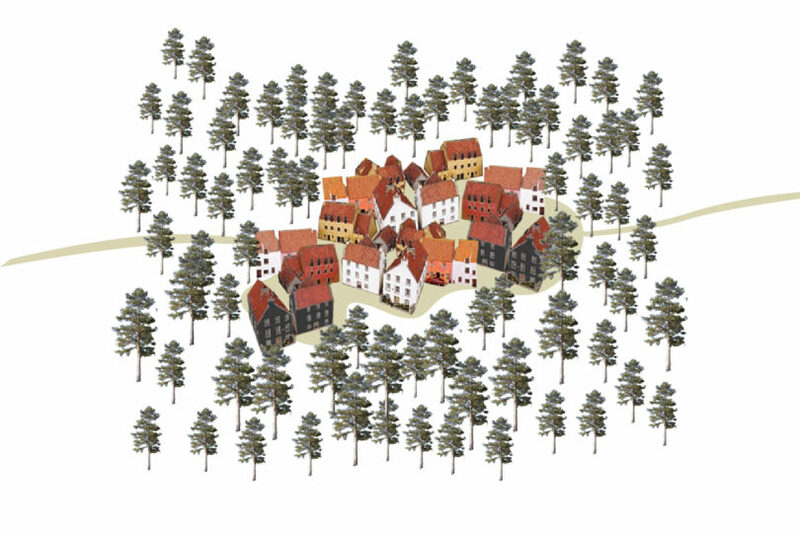 The plans are designed to bring the forest into the village. Green crossings between corridors will create a network that supports the migration of wildlife. We should be mindful how buildings contribute to the sustainability of the community as a whole as well as each household. The Design Guide should make it easy for self-builders, smaller firms or community co-operatives to build at An Camas Mòr, lending the community a variety and richness that a volume house builder could not match.